Hosea’s marriage to the unfaithful Gomer masterfully mirrors the relationship with God and unfaithful Israel. His writing’s would reach through the years and find themselves as a teaching point of the Master Teacher. 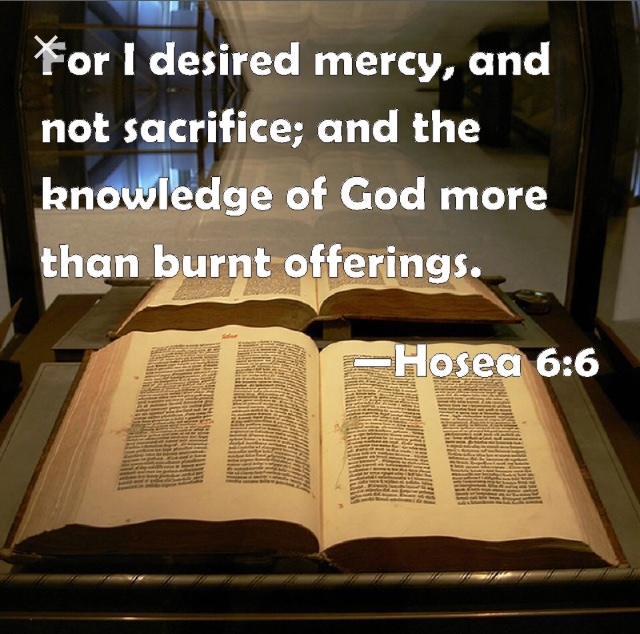 While being questioned for His association with tax collectors and sinners, Jesus offers up some homework for the pharisees directly from Hosea: “go and learn what this means: I desire mercy and not sacrifice” (Matthew 9:13; Hosea 6:6). Christ puts forth an interesting assignment, one that draws the reader all the way back to Hosea. Hosea writes of God’s charge against unfaithful Israel, their call to repentance, their fall, and closes with their restoration. Throughout the book Hosea brings to attention the sin of Israel and the separation that occurred as a result. Israel would take the gold and silver given to her by God and make it into Baal (Hosea 2:8;8:4), she would leave the fulfillment of God for the emptiness of pagans (Hosea 3:1), she would be a stumbling block for other nations (Hosea 5:1) and Israel would remove the boundaries between God and Baal (Hosea 5:10), yet throughout all of this, Israel still upheld the Sabbath and feast days (Hosea 2:11), and offered sacrifices to the Lord (Hosea 5:6). This was not out of sincerity or love, for their faithfulness had “left like the early dew” (Hosea 6:4), but out of habit. Thus God, who still wanted their worship, would says to His once faithful bride “I desire mercy (i.e. Goodness, Steadfast Love, Loyalty) and not sacrifice. . .”(Hosea 6:6), that is, I desire sacrifice with obedience, not insincere offerings. (Matthew 23:23). Christ uses the unfaithful, insincere, and the disobedient Israel to teach us two lessons that to this day remains applicable, (First) God cares about more than ritual obedience. Israel had offered God what He did not desire, sacrifices without love, in like manner today, many are good at going through the motions but forget that our worship to God is to be done in “Spirit (The right attitude) and truth (The right way)” (John 4:24). (Second) God is concerned about how we treat others. Christ taught Hosea 6:6 in the context of eating with sinners, and that their spiritual well-being needs to be important to us (Galatians 6:1). In the same manner “Christianity is not valuable because it gives a person spiritual knowledge. Ritual piety is empty, even when doctrinally correct, if it does not fill the heart with concern for others” (Mike Criswell, Commentary on Galatians pg. 245).